When it comes to camping organization is the key. When you are organized you can relax and have a good time. At least that’s how it is for me. I like when things run smoothly and if it rains and I don’t have the rain coats, we’ll it’s a wet and muddy mess. If I’m prepared with the rain boots and rain coats we all have a great time despite the weather. Over the course of the summer I’m going to provide you with some of my tips for making camping with the family a breeze. Tips that include menu planning, how to pack your camper trailer or pop-up, reviews of product and camp grounds and fun activities and games – basically all of my secrets for making camping fun, green and organized! For starters I’m going to share with you 5 of my all-time favorite camping recipes, recipes that I either make ahead- to enjoy , recipes my family love or that I’ll soon try on a future camping trip. We’ll be heading out this weekend for a long 3 day group camping trip and I’m in the packing mood! Breakfast Cupcakes: These are filling; I play with the ingredients and add any vegetables I have in the house. I can make these ahead of time and have them individually wrapped in foil to be warmed over the fire for a quick and healthy on the go-camping breakfast. 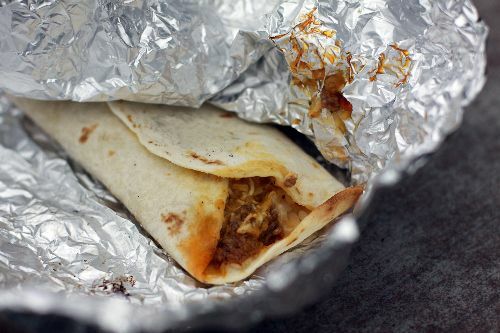 Campfire Toasted Burritos: I’ve adapted this recipe from Simplebites.net to meet the needs of my family. I add different veggies, sometimes hamburger meat, other-times shredded chicken or steak cubed. It depends on the leftovers I have in my house the week we go camping. I often make these ahead of time and individually wrap them in foil. The family can eat them for lunch, dinner or breakfast and we’ll pair them with fresh fruit and chips and salsa. It’s a win-win for an easy camping meal. Grilled Cheese Pull-Apart Sandwich: Again, I’ve adapted this original recipe depending on what meat I have left in my fridge or what might be on sale. Ham and provolone cheese with spicy mustard is delicious but I’ve also made this with turkey or corned beef for more of a Ruben and served with pickles and chips. A hit! A Crock Pot Feast: This is something that everyone will love and if you’re hosting a group dinner with other campers you’ll be loved by all. 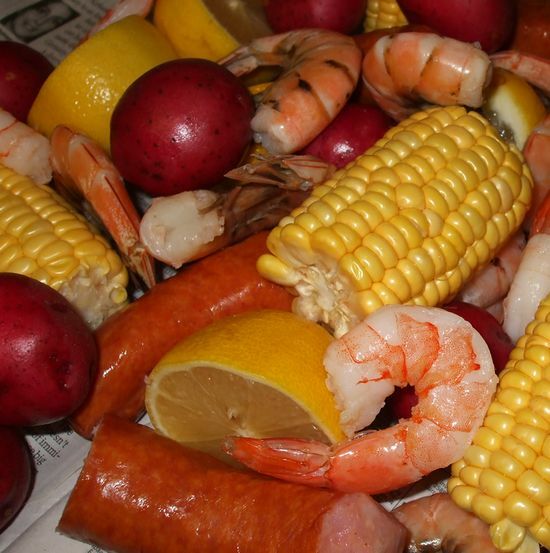 I make this with spicy seasoning and with a mild seasoning depending on the group but the shrimp, sausage, corn and potato combination served with a big skillet of corn bread will be to die for! This is easy to throw together the day of and let cook all day – your camp site will smell delicious so beware! The full recipe can be found here but if you read through the comments you can see what might or might not work for you family. Pancake Bites: I’m a lazy morning camper so I like breakfast to be easy and the pancake bites with some sausage on the griddle make life easy. I make these ahead of time and either warm them in a microwave or wrap them in fours in foil to heat for only a minute over the hot campfire. The kids love them and with some yogurt they make for a hearty and filling breakfast. This makes me want to go camping!! I think I need to a wait until the youngest is at least potty trained though! Great recipes! We had the pop-up camper even when my daughter was potty trained and it was hard in the middle of the night – even for me if I had to get up and go. We tented while we potty trained and it was tough but we did it. Having our new travel trailer with a bathroom is much nicer and easier! We make great family memories camping!